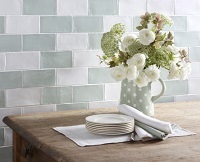 The Laura Ashley tiles collection has been designed to complement the current range of Laura Ashley interiors. Whether you want to create a beautiful bathroom using the elegant Erin prints or a country kitchen with the Bramley pastels we have the tile here for you. Browse the catalogue and click on the design of your choice to see the individual tiles in that range. Laura Ashley floor tiles from the Isadore, Cambridge, Malvern and Wiston collections are the perfect way to complement and co-ordinate the quintessential English brand of Laura Ashley's fabrics and wall coverings. 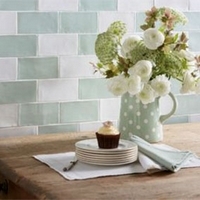 On the other hand, when it comes to walls you can't go past our Laura Ashley wall Tiles collection. Be it the strips in the Highgate and Erin range, or the mosaics of Canterbury, you'll find the perfect Laura Ashley tiles to give you home the exquisite touch of class and eloquence that only Laura Ashley can provide. This extensive and well presented range, make the ideal choice for bathrooms, Kitchens and other areas where class and eloquence are significantly important. Browse this easy to use website and check our prices, we are sure you'll find what you're looking for and at the right price! Once you've made your choice, you can order directly online and if you do it before 10 am, we will dispatch it on the same day, so you could be tiling this afternoon! Additionally, for your convenience and comfort we also offer a free call service at: 0800 195 6620, call this number and our expert consultants will give you all the free and valuable advice you need.